Upon returning from Philadelphia on June 11th, Caligula was pretty upset. MJ got into town a few days earlier, but left for work all day and then spent much of the weekend away. 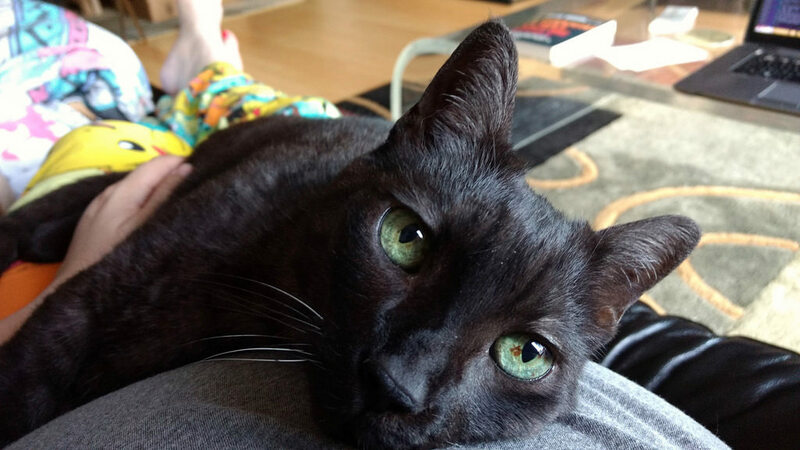 Two weeks is a lot of time to leave him with only the company of a friend dropping by every couple of days to check on him, and he let me know with an afternoon of yowling and snuggling. He’s been a very different cat since the loss of Simcoe. We always thought that she was the one following him around for snuggles, and I’m sure that was the case, but he’s been spending a lot more time snuggling me, on the couch, under the covers in bed. His unhappiness being left without humans is a big change too, he really doesn’t like being left all alone. We had no idea. Plus, recently we’ve also had to contend with some health uncertainty with him. His calcium levels have been running high, and I had to drop him off at the vet a couple weeks ago for a day of tests to see if we could get to the bottom of it. Alas, we haven’t, but a lot of major things (like leukemia) have been ruled out and so we just have to move on to symptom treatment once he sees a cardiologist about a potentially enlarged heart, which could influence his treatment plan. I’ve spent a little time since my return on getting up to speed with the latest work Partimus is doing. We’re now in six low-income residences in San Francisco with over a dozen machines, many of which are high end systems donated recently by a local company. 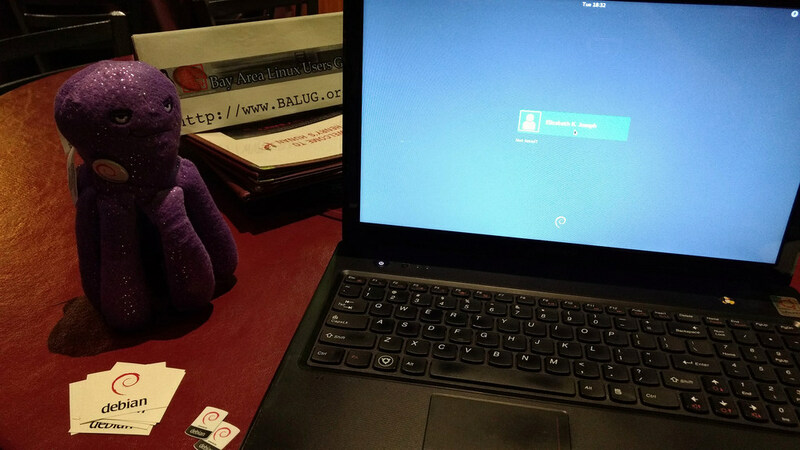 We also have a new imaging server created by one of our volunteers, which I hope to find time to have a look at and see about adding the 64-bit Lubuntu image to, as well as documenting the configuration so that it can be replicated at other sites. I spent some time this weekend updating Partimus.org so that the information on the site is more up to date and cleaned out some of the old materials we had floating around. I also did some curious digging into our foundation documents and discovered, as I had suspected, that 2017 marks the 10th anniversary of Partimus being incorporated as a 501(c)(3). I wrote a blog post about it here: Partimus celebrates 10 years. Last Saturday MJ and I headed up to Napa before he headed off for a work trip on Sunday. The day began with furniture shopping though. Our sofa bed recently broke, and it’s growing increasingly creaky as a couch. It’s unusable as a bed at this point, and for a guest staying with us this week we’ve had to get an air mattress. A new couch is needed! We ended up in Concord at a leather store browsing some potential candidates. I think we found one we want, we just need to figure out what color we’re going to go with. I also got some great ideas for furniture in my future office, there is a really nice Dreamsations chair-and-a-half that lives as a big comfy chair, but folds out into a comfortable twin size bed. 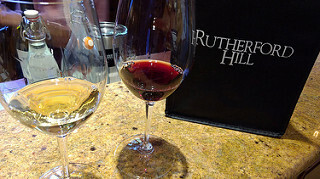 After the furniture shopping it was up to Rutherford Hill Winery to pick up our wine club wines for the quarter. It was hot, possibly the hottest day of the season with the highs brushing up against 100. It was 98 outside as we cooled off in the wine tasting room. I spent a few minutes outside taking pictures of flowers and the view, but even this west coast dry heat is hot when the temperatures soar that high. It was then off to a late lunch at the Bouchon Bistro just south of Rutherford, in Yountville. We went there during our first trip to Napa last spring, but it was a whirlwind weekend trip where we tried to squeeze the best of the valley in all at once. 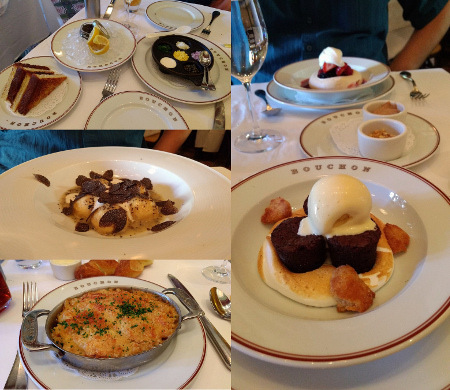 This time Bouchon was a destination for us. With 3:30PM reservations, we arrived at the tail end of brunch, with staff setting the tables for dinner. Our food selections were very dinner-like though. We kicked off the meal with caviar with some toasted bread, and I had a White Apron beer by Anderson Valley Brewing Company in Boonville. Next up were the entrees, MJ picked the winner with a dish of gnudi with fresh truffles, and I went with what was pretty much a lobster macaroni and cheese, also delicious but not quite as exceptional. By the time desserts rolled around, we were getting full, but desserts of chocolate brownie “bouchons” and fruit with meringue were a bit too amazing to resist. After the meal, our journey home took us over the Golden Gate bridge for a nice evening in before MJ’s trip. While on the topic of food… I made eggs! I’m not much of a cook, I lack the patience and interest required to pull off more than just the basics. As a result, until a few weeks ago all I had ever made egg-wise was scrambled and hard boiled eggs. 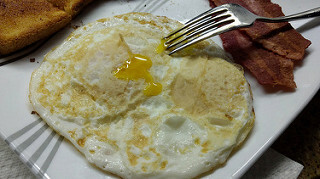 Unfortunately or me, my favorite eggs are over easy. I finally decided that I should learn how to make them without ruining them, it can’t be that hard, right? I fired up YouTube and piled on the patience. It turns out patience was what I’d been missing in past attempts. I hover over the eggs and then try to flip them much too soon, what I need to do is let them cook a whole lot before flipping is easy, and then I just need to let them cook for a few moments longer to finish cooking the whites. At 35 years old it may seem terribly amusing to onlookers that I just figured this all out, but I really don’t cook. It’s a big deal for me. Over easy eggs forever! Sadly, after Napa, food was the last thing on my mind. The day MJ left was the day my stomach decided to ruin my week. I went to the gym mid-day, seeking some air conditioning in what had turned into quite the warm weekend in San Francisco too. Unfortunately the gym lacked air conditioning, but the fans did their job and I had a good workout. That afternoon I felt incredibly tired (just the gym, right?) and by Sunday night I was feeling queasy. Monday morning I had a full on stomach bug, complete with a mild fever. The fever went away and I was feeling better by Tuesday evening, I thought maybe the heat wave had just hit me the wrong way and I started rehydrating. Wednesday night I was hit with the second wave of illness which kept me up for much of the night. I went into work Thursday morning, but left mid-day to see a doctor, who gave me a prescription to treat the nausea that wasn’t allowing me to keep any food or liquids. Pile on some over-the-counter meds for other symptoms and gallons of re-hydration liquids, and you have my Thursday afternoon and Friday. Fortunately I was well enough to work from home (bed), though the slight fever did return Friday afternoon (ok, maybe I wasn’t well enough to be working, even from bed). Friday night and into Saturday I continued my attempts to hydrate and eat bland foods, but a massive headache swept in, that I kept in the realm of tolerable only through regular doses of Advil. I spent the day in yesterday, but I managed to go out to dinner last night with MJ and a visiting friend, though I was cautious and didn’t eat very much. While I thought I was feeling better on Tuesday I snuck downstairs to a Bay Area Linux Users Group meeting just a block from home. I figured if I wasn’t feeling well I could just leave midway through, and I wanted to attend to talk about the latest Debian release (9.0, code name Stretch)! So attend I did, bringing along Debian stickers and my Stretch toy. It was a small dinner, but lots of nice conversations about Debian, recent changes with Ubuntu, and even some model trains after I geeked out about my new interest and subsequently learned about the Golden State Model Railroad Museum, must go! With MJ back in town, Friday morning we went to the eye doctor to pick up new glasses! I’ve spent the past several years with Flexon frames, they’re super light and resistant to abuse due to their ability to bend. I switched things up this time and went with Airlock frames, which are in the family of rimless glasses. It’s quite the departure for me, and I don’t like change, particularly when it has to do with how I look. 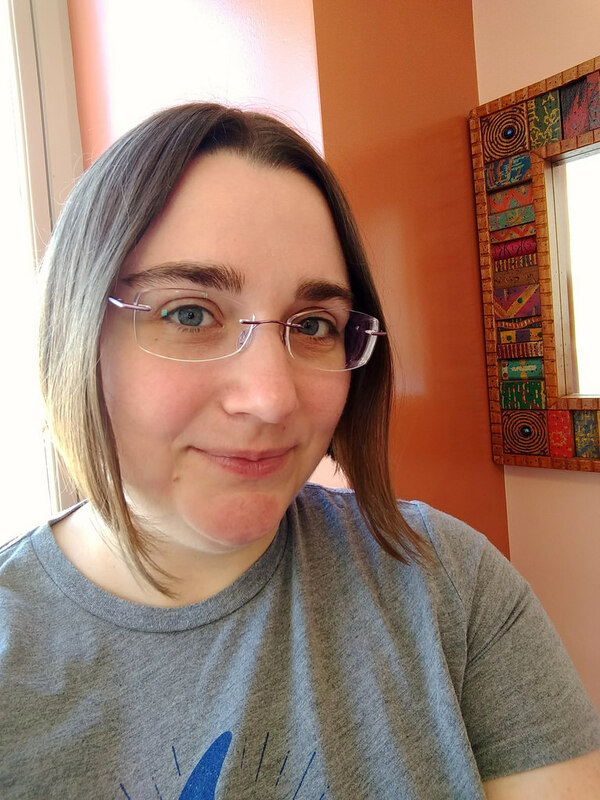 But I had also just gotten a whole new haircut that went shorter than I’d previously gone, so apparently I’ve been in a change mood. I think it worked out, I’m happy with both the glasses and the haircut! Today I’m feeling better. The headache isn’t bad enough to require treatment today, and I’m trying to take it easy. I did spend about 90 minutes getting some fresh air while MJ was out with his friend. 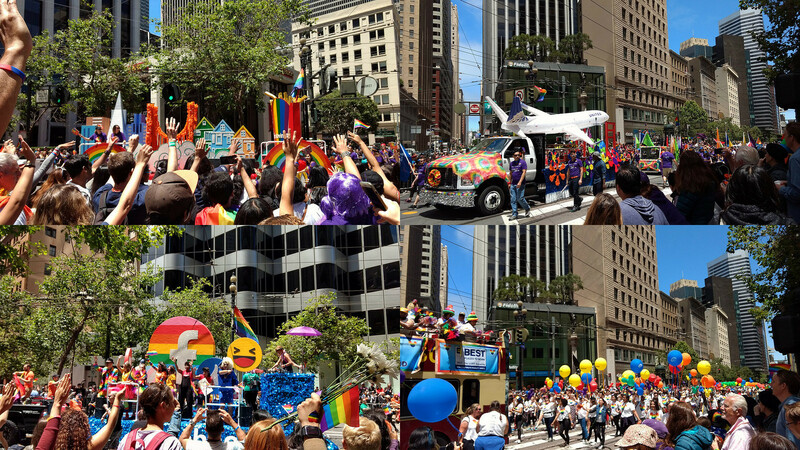 I walked a couple blocks up to Market street to check out the Pride parade. Once I grew tired of the crowds I walked up Market to Ferry Building to pick up a small lunch, champiñones (mushroom) empanada and dulce de leche alfajor at El Porteño. From there I took a few pictures of street cars before wandering back home. The month winds down this week. I’m helping to host a Meetup at work on Wednesday and taking Thursday off to spend with a friend who’s in town visiting, we shall do all the San Francisco things! Then we have a much-needed a four day weekend for the 4th of July. 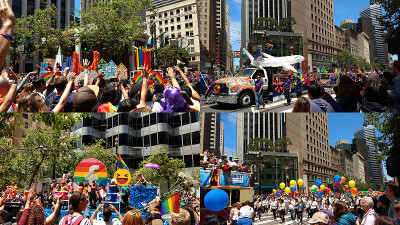 This entry was posted on Sunday, June 25th, 2017 at 5:21 pm and is filed under caligula, events, life, san francisco. You can follow any responses to this entry through the RSS 2.0 feed. Both comments and pings are currently closed. Entries (RSS) and Comments (RSS). 21 queries. 0.083 seconds.